SNAFU! : This is what future Chinese air power will look like. pic via AllAboutMilitary192781 Tumblr Page. 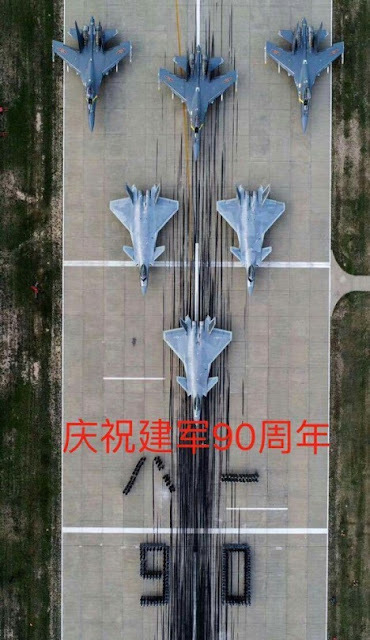 This is what future Chinese air power will look like. pic via AllAboutMilitary192781 Tumblr Page. One on one I still believe our airmen can win the day. But I don't believe the fight will be one on one. I am concerned about China's manufacturing might. We're already seeing it with the high rate of production when it comes to their Navy and turning up the volume on aircraft and armor will be child's play. Additionally while they are hardly innovative they are excellent at "acquiring" (I actually mean stealing) technology that they find useful thru whatever means necessary. In short we'll be fighting an enemy that is just a tad less sophisticated but not markedly so, with a numbers advantage that will simply engage us in a war of contrition attrition (thanks to a reader for the correction, I'm obviously brain dead this morning)...a war we can't win. Don't think about China gear in a one on one matchup. Think about China outnumbering us in aircraft, ships, tanks and troops. Think about them being just a step behind us in tech. And finally think about our forces being stretched around the globe attempting to fulfill too many missions. My prediction? Marine Corps and Army ground officers better start studying Guadalcanal. My bet is that in the near future, more than one unit will be left far out on a short limb.